Launchers Part 2 – Simplified Launchers | 22 Point Blog! The quick recommendation: EqualEyes gives speech access in older phones and comes pre-configured but is very expensive. Seniors phone is a neat simplified package, my personal favourite is still Big Launcher. As well as Big Launcher, there are a number of launchers which have been designed for the vision impaired or elderly, most of which try to make the interface as simple as possible and in many cases restrict the features you can access easily. Because of this, I would recommend them to someone who really needs a simplified phone, with other features hidden from use. EqualEyes comes completely pre-configured. 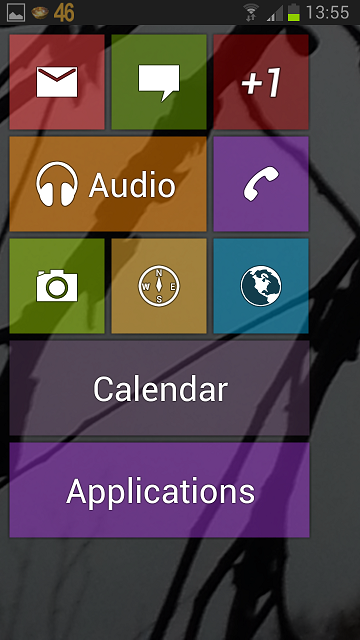 It has three screens with two columns of five icons already setup. 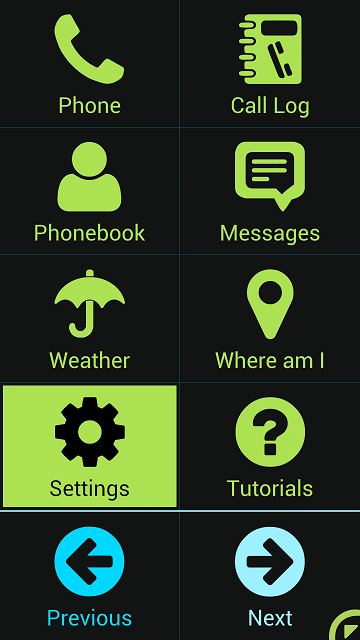 The icons are about 14mm high, single colour (green by default) and the launcher automatically uses Talkback speech. One great feature for speech users is that it implements its own ‘explore by touch’ which means that it’s completely useable without sight even on Android 2.x. 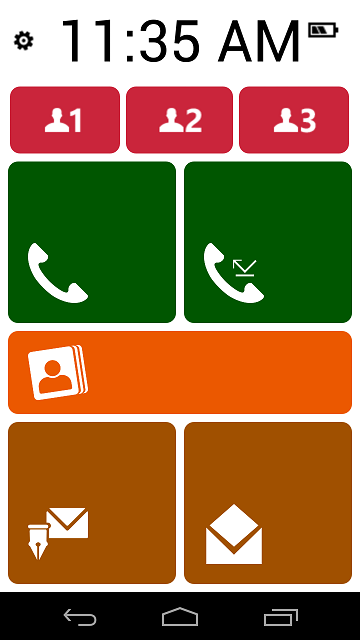 It also includes an OCR app built in, phone book, dialler, call log, messages, weather, ‘Where Am I?’ and more. The font varies from 9pt for the icon labels, up to 34pt for messages. The biggest drawback for many will be that a 2 year license is an in-app purchase for $64. The demo works for 30 days. A basic single screen, which gives you access to a few of the phone’s default key functions (though some of the buttons didn’t work on my Note II). It does give you access to the all apps list, though not in large print and nothing else is modified – it also only displayed on about ¾ of my screen. 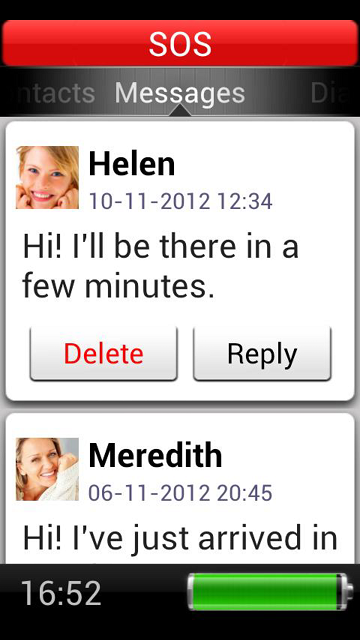 With Talkback, text labels (calendar and applications) are read but other buttons are unlabelled. 10 screens & an SOS button: settings & Quit, Memo, Flashlight, Camera, Gallery, clock, contacts, messages, dialler and call log. Font sizes range from about 10pt in call log received time, to 18pt for the name of the caller. Works well in many areas with Talkback, but not all buttons are labelled. 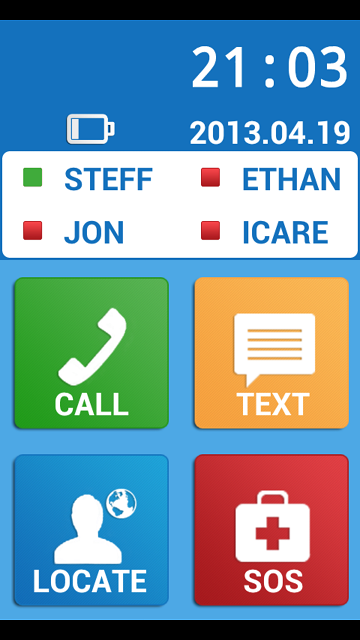 A single screen with clock, three contacts shortcuts, dialler, call log and text message functions. Text sizes vary – Text message contact is about 28pt but the message itself is only 14pt. Using Talkback, buttons are listed twice when swiping (once as simply “button” and once named correctly), otherwise seemed to work ok.
A single screen with buttons to call contacts or send pre-set text messages, including location information or SOS message. Weather, time and battery also displayed on screen. Most details are in 16pt. With Talkback, most buttons have visual text labels and work well although several image only like the ‘back’ button read simply as button). 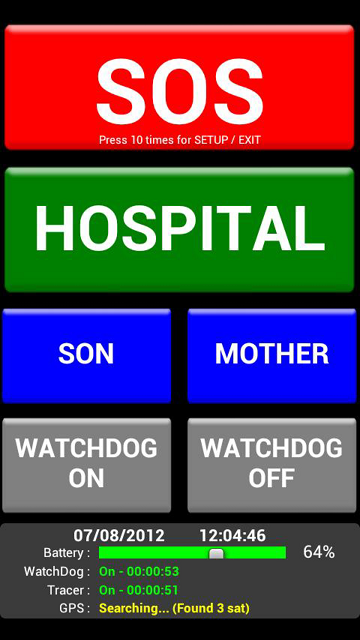 One screen with up to six big buttons to directly call contacts, however the setup screens are in about 8pt. With Talkback, the main buttons read, but battery status etc don’t read. EqualEyes looks promising though the price is very steep and the fonts vary in size. Most of the others here are much more restricted and also vary in font sizes. Seniors Phone is a great neat package for what it does. Personally for many large print users I’d still recommend Big Launcher. This Post was tagged accessibility, android, large print, Launchers, seniors. Bookmark the permalink. I’m EqualEyes co founder and I’ve enjoyed your blog. You told truth in it, although I feel, I must say a thing or two about the EqualEyes pricing. One of the reasons, besides functionalities, that the price for EqualEyes is so high is that we offer a lot of customer support and we care about our customers. We are focusing on the blogs, like yours, on how to improve EqualEyes even more. We are always searching for new information that could potentially help our customers. When we find something new, that we believe it can help you, we let you know. Smile I’m quite confident that we are, for now, the best choice for a new blind person that isn’t familiar with Android, although we are a bit pricey. There are also a few launchers out there specifically for blind and low vision users other than Big Launcher. I try different ones ocassionally, but always seem to come back to Big Launcher or Launcher for Blind People. Launcher for Blind People is based on the Eyes Free Shell, but uses. An easier and simpler layout. it only requires vertical scrolling, but lacks the ability to assign shortcuts. Blind Communicator is another nice one, but font can not be adjusted as far as I know. There are a few others and indeed a few new ones since I wrote about launchers. I try them out when I come across them, although I must admit I haven’t found anything quite as good as, particularly Big Launcher. Launcher for Blind people is good – probably not the name I’d have used but certainly easy to tell who it’s aimed at!